I started going to bars at around age 6. My grandfathers on both sides would take me for neighborhood walks that always included a few tavern stops. They’d show me off to their drinking buddies, buy me a 7UP, and give me a few dimes to play Skee-ball. But the thrill was short-lived because I was usually the lone child in these places — a playful soul who preferred hanging outdoors with my peers. 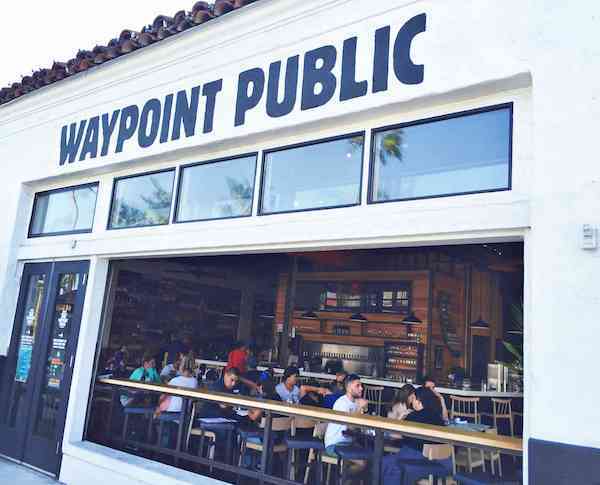 Lucky are the tykes who end up at Waypoint Public in North Park with their young, hipster parents. Like Blind Lady Ale House in Normal Heights and Station Tavern in South Park, kids are regular inhabitants. They’re afforded games, toys and special menus. 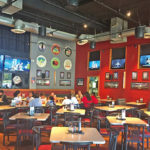 At beer-centric Waypoint, there’s even an indoor playpen framed by a drink rail, which was utilized by a few dads I spotted during happy hour as they drank from large bottles of various beers while casually watching over their frolicking offspring. But the kid-friendly environment isn’t what brings me here. 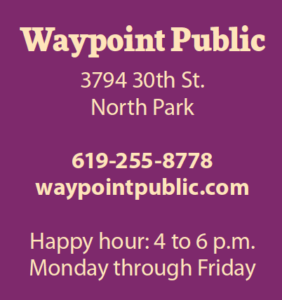 It’s the $5 drafts that call during weekday happy hour, not to mention Waypoint’s airy interior. When the retractable windows are rolled up on two sides of the building, which is usually always, it feels as through you’re part of the bustle of North Park Way and 30th Street. Hence, the occasional child colliding into my knees becomes rather tolerable. I’m also a fan of the food, none of which is discounted during happy hour. 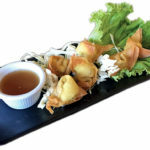 Although the menu features several side dishes priced at $5.50 — not bad considering I often pay more for noshes at other places with the happy-hour discounts. Of the three rotating tap beers available during happy hour, I recently chose an English Oat Ale boasting whispers of coffee. It’s a golden ale crafted in collaboration by Eppig Brewing and Ballast Point Brewing — refreshing and with a sweet, malty finish. 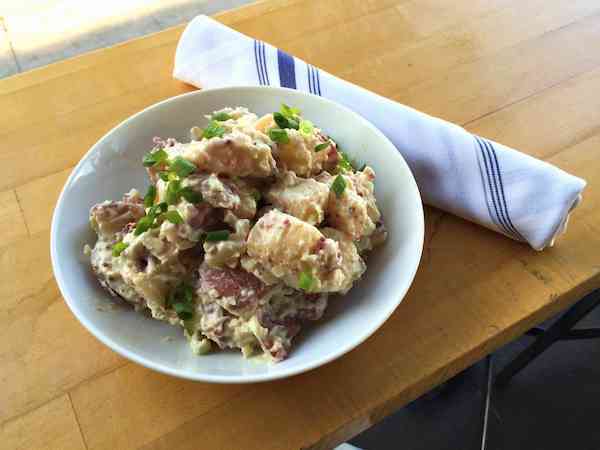 I paired it with a heaping side dish of Carolina-style smoked potato salad speckled with green onions, celery and mustard seed. The potatoes were dressed judiciously in mayo, and their smokiness struck a fine chord to the coffee notes in the beer. In a subsequent visit, I popped in quickly for a $5 glass of IPA by San Diego Brewing Company, one of my favorites from the Mission Gorge facility. If you forgot what IPAs tasted like before brewers unleashed mega doses of hops into their products — this is a swell reminder. Passing that time on the side dishes, which include roasted vegetables, herbed french fries, and Israeli cous cous with harissa vinaigrette, I dashed across the street afterwards to Mr. Moto Pizza House and paid $3.50 to fulfill my hankering for a slice of cheese with pepperoni. 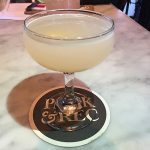 In this commercial hub of North Park, you can conveniently piece together happy hour exactly to your liking. 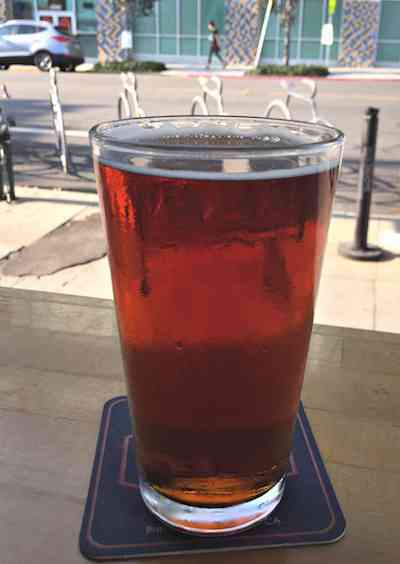 There are only three draft beers discounted during happy hour, but they vary in style and hail from local breweries. A few wines are also available for $7 a glass. You’ll pay regular prices for food, which includes several side dishes such as smoked potato salad for only $5.50. 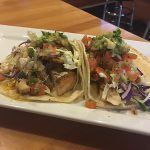 If you choose to go further, you’ve come to the right place for other items such as jambalaya, gourmet burgers and Moroccan-style tri tip. Expect to save about $2.50 for draft beer and wines by the glass during happy hour. The bartender on duty provided fast and personable service, a multi-tasker who didn’t leave anyone in the hang. 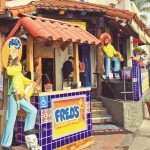 Situated ideally on a corner lot with retractable windows, the breezy interior features wood panels in assorted colors, a large bar, window-ledge seating and a play area for kids.